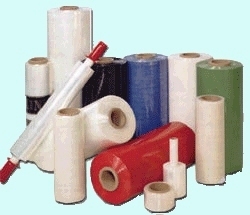 We import bulk stretch films from some of the most modern manufacturing plants across the globe. State of the art manufacturing technology ensures that when you trust ECOPAC with your stretch film requirements you get a product that not only performs to the highest standard but also meets your price targets too. Available as a standard, pre-stretch, power pre-stretch or even a super power pre-stretch, our range of machine film comes in clear, blue, green, red or black. We also supply a large range of hand applied films with standard or extended cores in clear, blue, green, red or black. See our machine page for details of our automated stretch wrapping machines or hand applicators.